Our production of Beauty & the Beast harks back to pre-Disney versions of the well-loved tale – but with our very own twist. 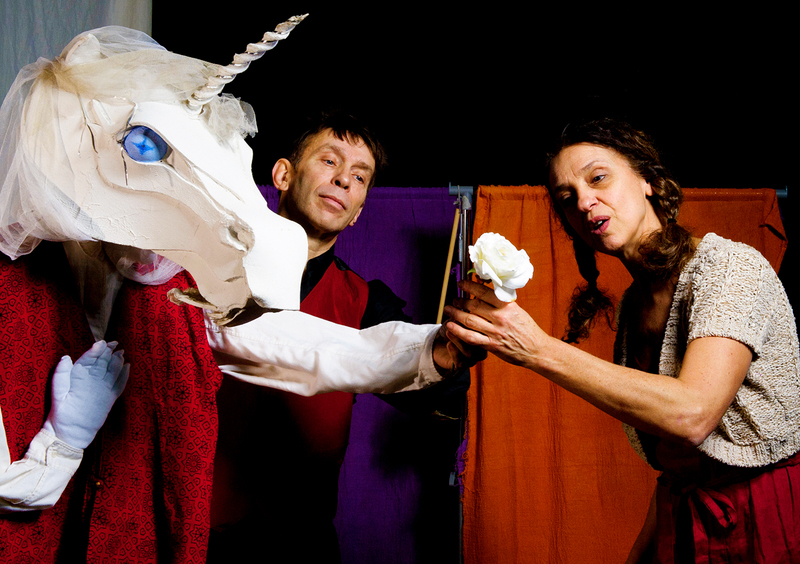 An old woman who claims to be a princess with magical powers and a reluctant security guard use music, song, puppetry and video projection - as well as high-octane physical acting - to recreate the story in the cellar of a crumbling old theatre. 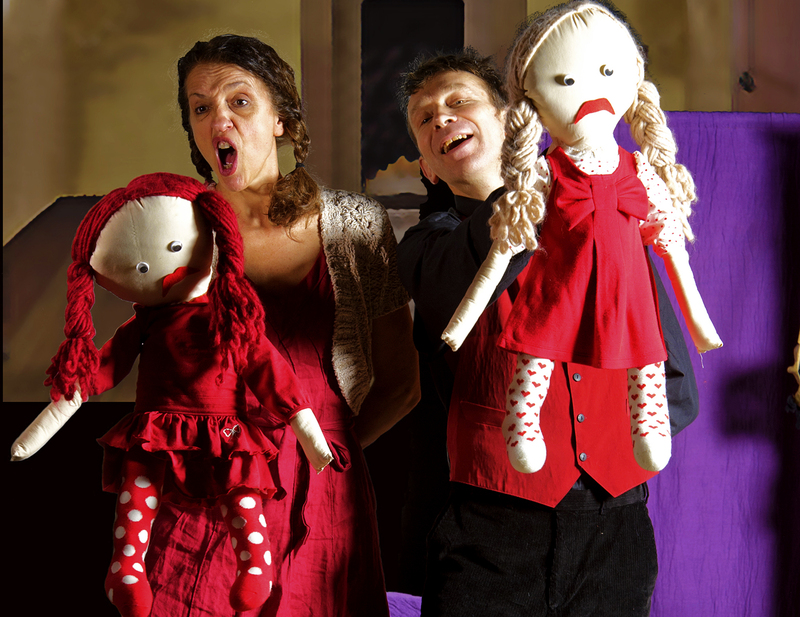 Children and adults alike enjoy both the bravura fun of the storytelling and the genuine drama and pathos of the tale as it unfolds. access to a 13 amp sockets for the lighting rig and projection & sound equipment that we carry. An old woman trespassing in a disused theatre claims to be a Princess. Princess Nell. The security guard, Bill, tries to throw her out but doesn’t succeed. She entices him to help her tell a story by dressing him up as a Father and Bill soon gets thoroughly involved in the business of acting out the story. This Father was a rich man but has fallen on hard times. His eldest two daughters, Esme and Clotilda blame him for their misfortune but his youngest daughter, Beauty, tries to cheer him up by singing his favourite song with him. A Messenger arrives with a letter telling Father that two of his ships have made it through the storms and that he is a rich man again. Beauty helps her father to get ready to go to the Big City to see his ships and goods arrive in harbour. The Messenger offers to accompany Father as there have been rumours of wolves howling on the moors at night. Esme and Clotilda ask Father to bring them back expensive outfits but Beauty just asks for a white rose. Father is away much longer than Beauty expects and when he does return she runs to open the door for him. Father howls in despair when he sees Beauty. He tells his daughters that his journey to the Big City was a disaster as his last two ships had also been lost at sea. He tells them that as he prepared to return home he discovered that his horse, Greyling was in fact a talking horse. As they journeyed through the snow, high on the moors, a sudden howl made Greyling rear and run away leaving Father on his own. Father saw a distant light which led him to a mysteriously empty castle. Greyling was there happily munching away on fresh hay but she told Father that there appeared to be no-one else around. Father started to eat some food he found laid out on a table when suddenly a Unicorn appeared and calmly encouraged Father to take a rest. In the morning just as Father was about to set off again he saw a white rose bush – although he couldn’t afford the expensive outfits his elder two girls had wanted he decided that Beauty should have the rose she asked for. As he plucked the rose a huge and ferocious Beast appeared roaring at him. The Unicorn translated the Beast’s roars, telling Father that either he must stay there as punishment for trying to steal the rose or he must send in his place the first living creature he sees when he reaches home. That first living creature turned out to be Beauty. So now Beauty has to go the Beast’s castle. She sets out determined not to be afraid and is happy to find Greyling there. The Unicorn kindly gives her a gift from the Beast – an exquisite cloak. Beauty wants to see how it looks in a mirror. But the Unicorn explains that mirrors are not allowed in the castle. The Beast joins Beauty for supper and she persuades him to let her see his face and although she is, at first, frightened by the Beast he manages to say her name and she sees that he is gentle. Meanwhile back at home Esme and Clotilda are making Father’s life miserable. They lounge around demanding cups of tea whilst he has to do ALL the housework. Beauty is lonely in the castle because the only person she can have a proper conversation with is Greyling – but she does try to teach the Beast to talk and then to dance. She grows more and more comfortable with the Beast and he confesses that he loves her and wants to marry her but she tells him that although she is fond of him she doesn’t think she’ll ever love him. The Beast is very sad. Then one day whilst exploring the castle Beauty finds a magic mirror. Intrigued she looks into the mirror and sees not herself but her father who appears to be dying. Her sisters have been so cruel to him that he is now very frail and ill. She calls Greyling to take her home but the Beast says he will die if she goes. Eventually the Beast allows her to go after making her promise to return to him within seven days. Beauty gets back to Father in time to save him. Although Esme and Clotilda are very angry that Beauty is back they think that if they make Beauty stay longer than the seven days she’s promised then the Beast will be so angry with Beauty he’ll do something awful to her – which they think is an excellent idea . So they devise all sorts of nice things to do to make Beauty stay. And their trick works Beauty begins to forget the Beast. Until one night the Unicorn appears and asks her to look into the magic mirror. Beauty sees the Beast lying on the ground as if already dead. She tells her father that she has to go immediately. She flies to the Beast on Greyling. Beauty hugs the Beast and tells him that she loves him and he must marry her. The Beast is immediately transformed into a Prince. Beauty is horrified because she has fallen in love with the Beast but eventually she comes to understand that the Prince was the Beast whilst under the spell of a wicked fairy. Fortunately his fairy godmother – called Princess Nell - foretold that once someone loved him for himself and not what he looked like on the outside then the spell would be broken. And Beauty has done just this. An old woman who claims to be a princess and a reluctant security guard use music, song, puppetry and projection to play out the traditional tale of Beauty & the Beast. 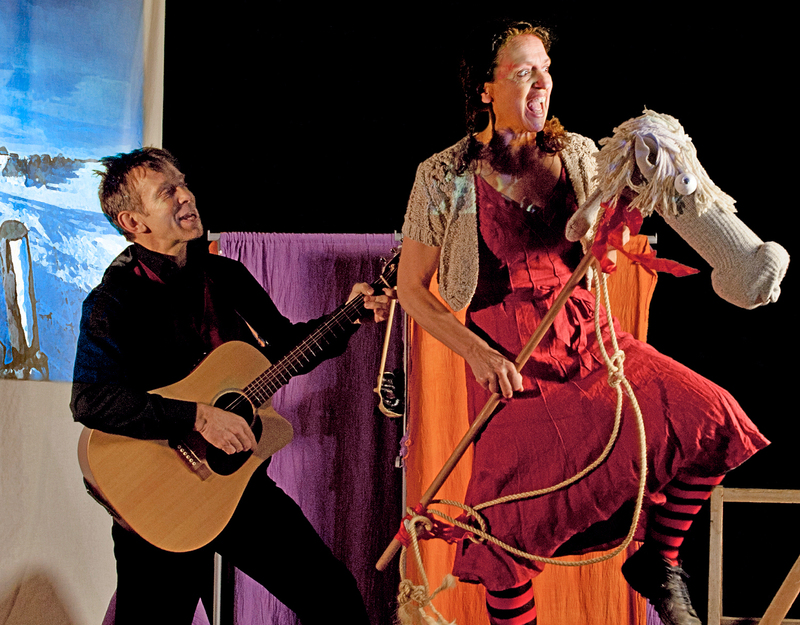 Nothing is quite as it seems in this lively and inventive version of the hugely popular story presented by one of the UK's most respected children's theatre companies.